Download "TURKISH CONTRACTING IN THE INTERNATIONAL MARKET. Brief overview"
1 TURKISH CONTRACTING IN THE INTERNATIONAL MARKET Brief overview Construction plays a crucial role in Turkey s economic development, accounting for well over 6% of GDP and employing some 1.5 million people. When the direct and indirect impacts on other sectors are taken into account the share of the construction sector in the Turkish economy reaches 30% and the employment rate (excluding agriculture) reaches %10. After a period of rapid growth in the 1980s, the Turkish construction sector witnessed a significant decline between 1993 and 2001; however, as a result of policies adopted after the two economic crises of 1999 and 2001 the sector experienced the start of a recovery in Increased economic stability, decreasing exchange and interest rates and attractive long term loans stimulated a demand for housing, playing a major role in this process; and consequent growth rates of 13.9% in 2002, 7.8% in 2003, 14.1% in 2004, 9.3% in 2005 and 18.5% in 2006 made construction the number one contributor to the economic growth of Turkey. By 2007 the growth rate of the construction sector reached 5.7% for the year; however, Turkey and its construction sector, suffering under the effects of the global crisis, experienced a decrease of 8.1% in 2008, followed by a further 16.1% decline in was a recovery period for both the construction sector and Turkish economy. In 2010, construction sector made remarkable progress and grew by 17.1%. The growth trend in the industry continued in 2011 as well and reached 13.9% by the end of the 3 rd quarter of the year. GDP Growth Rate (%) Construction Sector Growth Rate (%) The constantly growing global competitiveness of Turkish contractors and construction products and the foreign exchange revenues generated as a result, contribute significantly to the balance of payments of Turkey. Up until the end of 3 rd quarter of 2011, Turkish contractors have undertaken almost 6500 projects in 93 countries, with a total value of some 205 billion USD. On the other hand Turkey is among the world s top 12 producers of building materials such as cement, glass, steel and ceramic tiles. The research team that prepared The Strategic Plan for The Turkish Construction Industry in 2004 noted in its final report that "In no other country with the same per capita income is it possible to find a construction sector that is as competitive as the Turkish construction sector". 2 As is the case with many other export oriented economic activities in Turkey, the unique geographical location of Turkey at the crossroads of three continents Europe, Asia and Africa contributes a great deal to the global competitiveness of Turkish construction products and contracting services abroad. That said, Turkey s strength in the field is not only due to its location, as the country also boasts cost effective service at international standards, high client satisfaction, credibility in partnerships, extensive knowledge and vast experience in a wide variety of projects, familiarity with the business environments in the nearby regions, qualified manpower and a calculated risk based approach to business. In 2011, 31 Turkish contracting companies ranked among The World s Top 225 International Contractors" announced by the leading international industry magazine "ENR Engineering News Record". With this number Turkey ranked second in the world after China. COUNTRY China Turkey Italy USA Japan Spain S. Korea France India England Germany Other The investment environment in Turkey is becoming increasingly attractive for both local and foreign investors, and a positive growth rate in construction is expected in the years ahead. The Turkish construction sector companies are active in almost every country in the Eurasian market of 580 million people, covering an area of 26 million km 2. With a vast experience in international collaborations across 93 countries Turkish contractors are open to building and enhancing international partnerships not only in the field of contracting, but also in construction industry investments, ranging from the manufacture of construction materials to infrastructure, housing, industrial plants and tourism projects. The extensive know how and experience gained through working abroad for nearly four decades, in all kinds of challenging engineering projects and in all forms of business environments is among the distinctive strengths of the Turkish contractors. 3 History The Anatolian Peninsula, on which Turkey is located, has a history that dates back to 8000 B.C., when the earliest human settlements emerged. The region has been the birthplace of 13 major civilizations, which flourished and left behind many magnificent sites and structures. The incredible richness and diversity of Turkey s cultural heritage is an important factor that fostered the maturity of a building tradition in Turkey that has developed over millennia from the Hittites to the Romans, Byzantines, Seljuks and Ottomans. The development of the Turkish construction sector over the last 90 years since the foundation of the Turkish Republic can be evaluated in five successive periods: Preparation, internal market activity, international activity, market and product diversification and global competition. The first two periods continued until the beginning of the 1970s. After the foundation of the Turkish Republic in 1923, and along with the ambitious modernization process that accompanied the political and social reforms, important infrastructural and industrial investments were made all over the country. In the 1920s special measures, including the employment of foreign experts in public agencies, had to be undertaken by the government to overcome the shortage of local engineers and architects. Under the influence of these public policies, and partly due to the economic crisis witnessed in Europe in those years, many European engineers, architects and entrepreneurs came to Turkey; and in at least one third of the 28 construction companies established in Istanbul were European in origin. The 1930s marked the arrival of the first generation of Turkish engineers, who in the following decades founded many large scale construction companies and had great success in the realization of many challenging projects, both in Turkey and abroad. The political change that Turkey experienced in 1950 and its accession to NATO in 1952 were important milestones in the history of the Turkish construction sector in terms of the infrastructure investments that followed. In the same period, the first wave of Turkish engineers were graduating from universities and beginning their careers in an environment that offered great opportunities for the establishment of their own companies; and it was those businessmen that founded the Turkish Contractors Association (TCA) in 1952, making the organization one of the oldest NGOs in the Turkish construction sector. Water supply projects during the 1950s, and energy projects and the construction of large dams and power plants in the late 1960s and early 1970s provided many opportunities to Turkish Contractors to develop their activities throughout Anatolia. 6 Distribution of International Works by Nature of Work ( ) FIELDS OF ACTIVITY (%) Housing 36.7 Urban Infrastructure 17.2 Road/Bridge/Tunnel 7.0 Irrigation 5.4 Health Facilities 4.1 Pipe Line 3.6 Industrial Plant 3.5 Seaport 3.4 Dam 3.3 Soc. Cult. Facilities 3.0 Other 12.8 Other: Drinking Water, Commercial Centers, Tourism Facilities, Treatment Plants, Administrative Buildings, Depots, Airports, Petrochemical Plants, Power Plants, Energy Transmission Lines, Military Facilities Period In the 1990s, economic depressions and political uncertainties in the countries of the Middle East and Libya forced Turkish contractors to turn their attention to other countries in the nearby regions, with the new focus being predominantly on the Commonwealth of Independent States, Eastern Europe and Asian countries. Many large scale projects in the Russian Federation, Ukraine, the Caucasus, Central Asia, Germany and Pakistan were realized at this time. In the period the projects completed in the Russian Federation and in the other CIS states accounted for almost 60% of the country s international business. Market diversification was the major trend that characterized this decade. While the share of the Russian Federation increased (to 34.5%), Libya s share saw a drastic decrease (to 13.7%), followed by Kazakhstan (7.8%) and Turkmenistan (6.7%); while Pakistan (6.6%), Uzbekistan (3.9%), S. Arabia (3.1%), Azerbaijan (2.6%), Bulgaria (2.6%), the United States (2.5%) and Croatia (2.2%) emerged as new markets. Other important developments were the considerable decrease in the proportion of works in Saudi Arabia and the disappearance of Iraq from the scene. Despite a decrease in the share of housing works (24.9%) compared to the previous period, housing continued to be the number one activity in this period as well. This was followed by road/bridge/tunnel works (12.7%), industrial facilities (9.0%) and commercial centers (8.1%). 8 Irrigation 1.9 Other 3.9 Other: Depots, Energy Transmission Lines, Treatment Plants, Dams, Telecommunications, Military Facilities, Railways Period: "Booming Global Competitiveness" During the last decade, the annual volume of business undertaken abroad increased from 2.4 billion USD in 2002 to 24.7 billion USD in In the following years, under the effects of the global crisis, this figure decreased to 22.3 billion USD in During period, the internal and external forces and factors that have contributed to this rapid development can be grouped under the following three categories: The attractiveness of business opportunities abroad; reduced business opportunities in Turkey; and the increasing competitiveness of Turkish contractors: Domestic investments decreased significantly after the crisis in Furthermore, the "abnormally low tenders" in bids created unfair competition for qualified companies and forced them out of the internal market, eventually turning their attention to the international market and pursuing aggressively business opportunities in other countries. Having realized large scale infrastructure projects in cooperation with foreign partners in Turkey between 1985 and 2000, Turkish contracting firms had gained significant experience in the fields of project management, contract management and production to international standards. As a result of booming oil prices, investments increased in the oil and gas exporting countries. This process created attractive business opportunities for Turkish Contractors given their geographical proximity and their familiarity with local business environments, providing additional advantages in competition. 9 The combination of above factors would drive the annual international business volume of Turkish Contractors to grow at a pace that far surpassed annual targets. In this period, market diversification and specialization in certain types of projects were the major trends. The number of countries in which Turkish Contractors was working increased considerably, causing the percentage of work in each country to decrease relatively. In the aftermath of the interventions in Afghanistan and Iraq, the rebuilding activities in these countries were closely followed by Turkish contractors, and as a result, Iraq in particular has become one of the most important markets for Turkish contractors in recent years COUNTRY (%) Russian Fed. 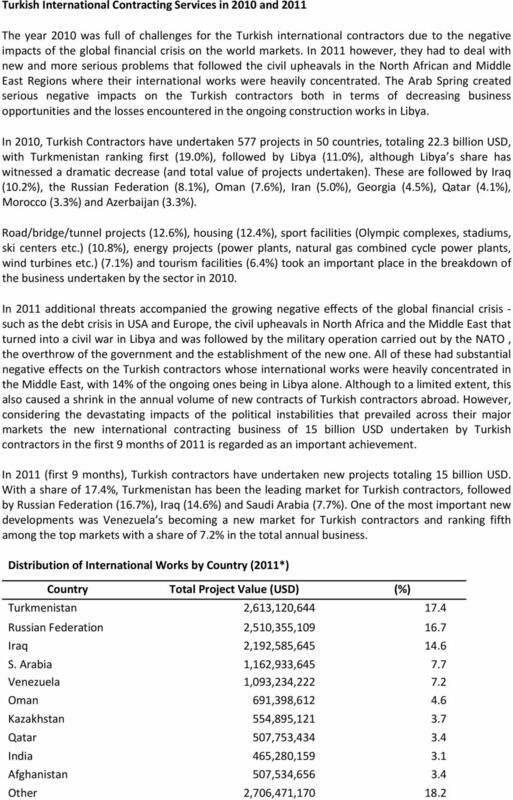 15,5 Libya 12,4 Turkmenistan 11,4 Kazakhstan 7,2 Iraq 6,0 Other 47,5 During the last decade Russian Federation (15.5%) was the biggest market for Turkish International contracting services. Russian Federation was followed by Libya (12.4%), Turkmenistan (%11.4), Kazakhstan (%7.2) and Iraq (%6.0) FIELDS OF ACTIVITY (%) Road/Bridge/Tunnel 15,5 Commercial Center 10,5 Housing 9,6 Industrial Plant 8,9 Airport 7,8 Other 47,7 Up until 2000, over 30% of the international works carried out by Turkish contractors was in the housing sector; however, this ratio has changed considerably in recent years, with housing now accounting for only 9.6% of the total between 2000 and Meanwhile the share of roads/bridges/tunnels, commercial centers, industrial plants, airports, pipelines etc. projects have seen a significant increase. 10 Top Ten Markets in the Last Three Years 2010 Project Value (USD) Share (%) Turkmenistan 4,252,048, Libya 2,460,471, Iraq 2,285,079, Russian Federation 1,797,186, Oman 1,699,245, Iran 1,111,767, Georgia 1,007,734, Qatar 907,181, Morocco 745,010, Azerbaijan 738,503, Project Value (USD) Share (%) Libya 4,210,110, Turkmenistan 2,673,831, Algeria 2,392,501, Qatar 1,525,668, Kazakhstan 1,484,465, Iraq 1,272,140, Russian Federation 1,268,846, Jordan 1,008,628, Saudi Arabia 919,861, Poland 845,950, Project Value (USD Share (%) Russian Federation 4,190,149, Turkmenistan 3,811,508, Libya 3,391,581, UAE 2,170,876, Iraq 1,409,666, Sudan 930,863, Ukraine 873,955, Qatar 798,745, Algeria 786,572, Saudi Arabia 781,479, Turkmenistan, Libya, Iraq and the Russian Federation have continued to be the leading markets for Turkish contractors over the last three years, with the total share of these four countries amounting to around 50%. Saudi Arabia and Algeria, being two countries in which Turkish contractors undertook a significant volume of work in 2008 and 2009, slipped down the top ten list in 2010. 12 TOTAL 15,005,562,417 *2011 first 9 months Housing (13.3%) has been the number one activity in 2011 (first 9 months) followed by the road/bridge/tunnel works (12.4%), energy projects (9.7%) and commercial centers (5.8%). 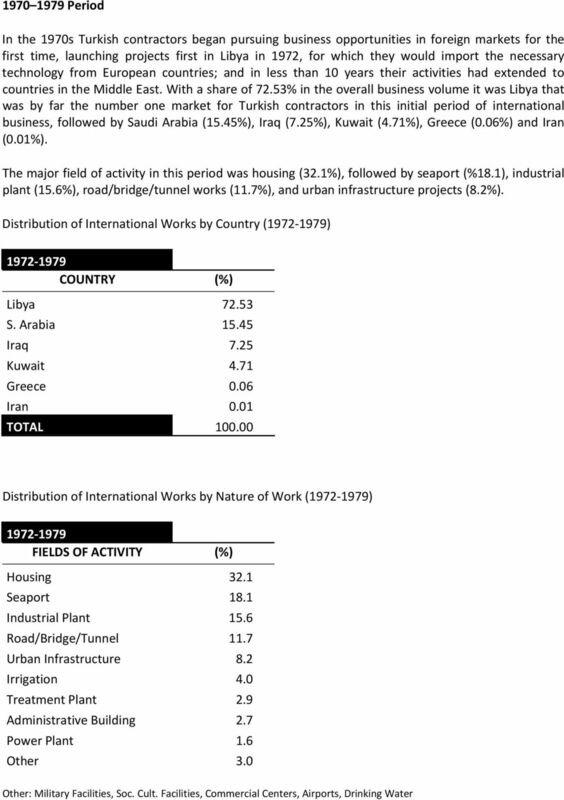 Distribution of International Works by Nature of Work (2011*) Fields of Activity Total Project Value (USD) (%) Housing 1,990,666, Road/bridge/tunnel 1,866,892, Energy 1,465,629, Commercial center 870,631, *2011 first 9 months Turkish International Contracting Services ( , 3 rd Q) In the (first 9 months) period, with a share of 17.8%, the Russian Federation has been the leading market for Turkish contractors, followed by Libya (12.9%) and Turkmenistan (10.8%). 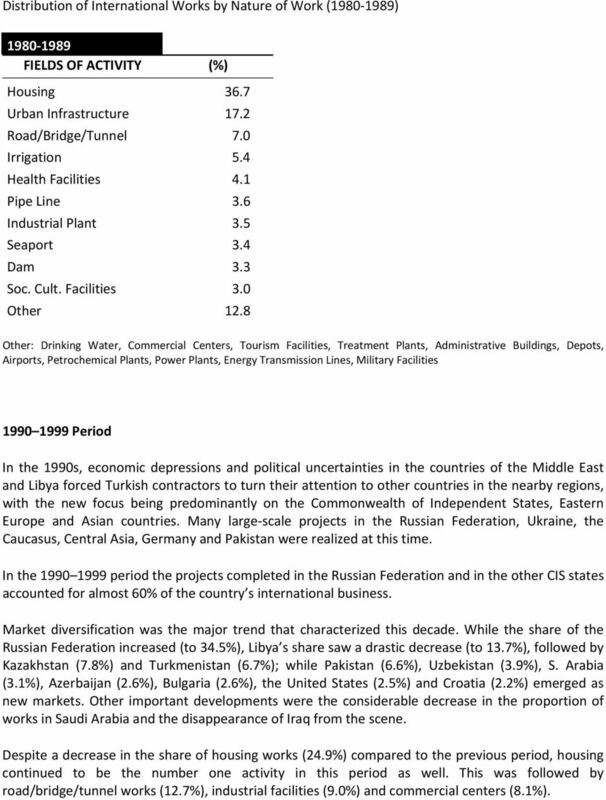 Despite the fact that the Russian Federation share has decreased in recent years due to the negative effects of the global financial crisis, it has maintained its position as the largest market for Turkish contractors in terms of total projects undertaken between 1972 and 2011 (first 9 months) (9 months) Country Total Project Value (USD) (%) Russian Fed. 36,292,066, Libya 26,427,390, Turkmenistan 22,069,281, Kazakhstan 13,799,815, Iraq 12,303,326, Qatar 11,384,697, S. Arabia 9,294,205, UAE 7,422,535, Romania 6,113,823, Other 59,010,410, Other: Oman, Azerbaijan, Afghanistan, Ukraine, Pakistan, Georgia, Iran, Jordan, Sudan, Uzbekistan, Yemen, Poland, Bulgaria, Venezuela, Israel, Egypt, Ireland, USA, Macedonia, Germany, Croatia, Tunisia, Albania, Kuwait, Belarus, India, Kyrgyzstan, TRNC, Latvia, Kosovo, Nigeria, Tajikistan, Bahrain, Syria, Angola, Ghana, Lebanon, Lithuania, Moldova, Bosnia Herzegovina, Montenegro, Malaysia, Holland, Burundi, Chile, Nepal, Kenya, Austria, Mali, Belgium, Serbia, Guinea, Cameron, Sierra Leone, Mongolia, Mozambique, Brazil, Armenia, Mauritania, Philippines, France, South Africa, Italy, Greece, Mexico, Finland, Gabon, Argentina, Niger, Malawi, England, Congo, Gambia, Thailand, Indonesia, Denmark Within the period between 1972 and 2011 (first 9 months), the shares of CIS, Middle Eastern and African countries in the overall international business volume of Turkish contractors were 42.5%, 26.5% and 19.5% respectively. In other words, the total share of CIS Middle East Africa countries reached almost 89%. WORLD HYDRO POTENTIAL AND DEVELOPEMENT. Triple-play subscriptions to rocket to 400 mil. Action required The Committee is requested to take note of the position of 2010 11 income and expenditure as of 30 September 2010.